Everyone knows the little mermaid in Copenhagen sitting alone on her rock. However, the capital of Denmark is home to many treasures which can be visited throughout the year. The 32 hectares of Frederiksberg Park in Copenhagen surround the palace of the same name built for King Frederick IV. Along its pathways and in its copses you can find hidden treasures, such as the amazing Chinese Palace or the English garden with its age-old trees. Here there is a lake, and there a little bridge leading to an oasis of greenery. The vegetation and the colours change with the seasons, each time offering different landscapes. Before or after this delightful interlude amidst nature, opt for a radical change of atmosphere by visiting the Cisternerne Museum, opposite Frederiksberg Palace. Here you find yourself in a former water cistern built in the 19th century, beneath the lawns and flower beds of Søndermarken Park. You will be immediately struck by this underground world, which held up to 16 million litres of drinking water for the local population. Once you have descended the staircase, you are completely surrounded by long corridors between endless lines of arches. Everything is illuminated by a subtle combination of sunlight from natural wells and cleverly positioned electric lights. The surprise of the first moments is followed by fascination and a sense of strangeness in this very mineral world. The extremely pared-back nature of the place makes it an exhibition hall which is unique of its kind, particularly suitable for showcasing contemporary art collections. Your stay continues under the charm of this unusual location. You can explore Copenhagen on foot, by bike along dedicated cycle paths… and in a kayak! 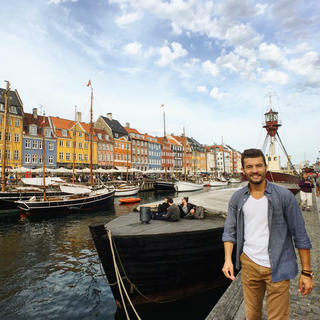 The old port of Nyhavn and the surrounding district has numerous canals which can be travelled along alone, with friends or the family, and in any season – you just have to adapt your equipment. Seen from your boat, the old city takes on a completely different appearance. On either side are rows of traditional houses with colourful facades. Dark and light blue, red, orange, ochre and pink … all competing to be the most dazzling, and the rainbow effect is even more beautiful when the sun comes out. 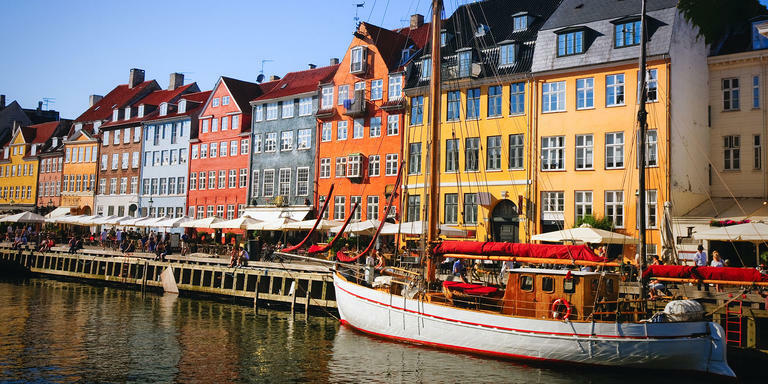 Sailing boats and tall ships are moored along the quaysides, a reminder that Copenhagen is a maritime city and a departure point for long journeys to the North Sea or the Baltic. The sight is very charming and worth lingering over. Next, treat yourself to a refreshment break in one of the numerous bars set up on pontoons and barges. Tie up your kayak and climb aboard these very sociable venues. Apart from the pleasure of kayaking and travelling at your own pace, you will be contributing to the Danish city's great ecological project. Particularly concerned about quality of life for its fellow citizens, the capital intends to achieve zero carbon emissions by 2025. 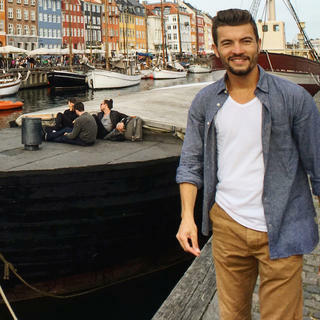 Discover another aspect of Copenhagen by strolling through Nørrebro, the capital's bohemian and multicultural district, built in the 1850s. Its streets are filled with a unique atmosphere and a creative buzz, whether it be from street art, its many boutiques or studios. The atmosphere here is decidedly informal and friendly. Take a walk along Elmegade, one of the most emblematic main roads. Perhaps you will find what you are looking for in a second hand clothes store, whose rails are set up on the pavement. Take a break in an amazing café: the Laundromat. Seated in the same room as the washing machines, you rub shoulders with customers waiting for their washing to finish while reading a newspaper or enjoying a game of chess! On the terrace or inside, the welcome is warm, the ambience simple and often merry. Next, indulge your curiosity and set off in search of the little courtyards carefully hidden amidst the crowds of passers-by. Between the streets of Fælledvej and Elmegade, you enter a veritable unspoilt paradise of greenery. In this inner courtyard with the feel of a public park, the inhabitants enjoy access to large, lush lawns. Away from prying eyes, this location happily cultivates the secret side which is typical of old cities. Copenhagen's lifestyle in a nutshell.